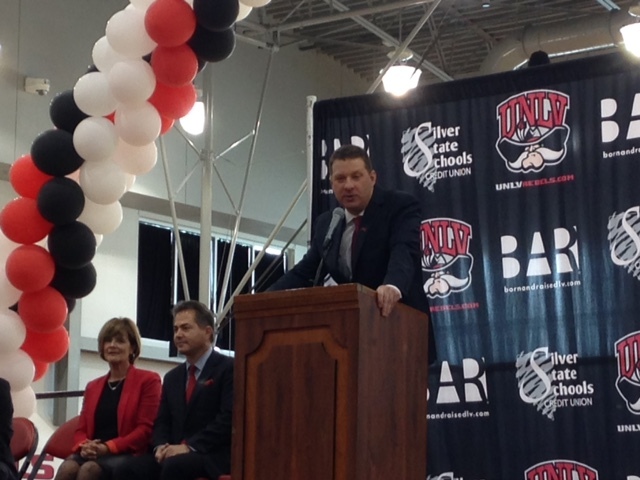 Eighty-nine days after Dave Rice was fired as head coach, UNLV finally officially hired his replacement when Chris Beard’s five-year, $5.75 million contract was approved by a 9-4 vote by the Nevada Board of Regents on Friday afternoon. The school announced Beard’s hiring back on March 28th but had to wait until the Board of Regents — never ones to pass up a chance to bask in the limelight — approved the contract before formally introducing the 12th full-time head coach in Runnin’ Rebels history. The 43-year-old Beard became a hot name after earning Sun Belt Conference Coach of the Year honors after leading Little Rock to a program-best 30-5 overall record and fifth NCAA Tournament appearance. The Trojans, who won the Sun Belt’s regular-season and tournament titles, rallied from a 13-point deficit in the final 3:33 of regulation to upset fifth-seeded Purdue, 85-83, in double overtime in the first round on the Midwest Regional in Denver. Little Rock then lost to fourth-seeded Iowa State, 78-61, in the round of 32. Beard spent 10 seasons as an assistant at Texas Tech, including seven under the legendary Bobby Knight. He also compiled a 47-15 record in two seasons as head coach at Division II Angelo State in San Angelo, Texas where he was named Lone Star Conference Coach of the Year after leading the Rams to a program-record 28 wins in the 2014-15 season and first-ever NCAA Division II Sweet Sixteen appearance. Beard said he was still in the process of putting his staff together and hasn’t hired any assistant coaches yet. He said he has been busy laying the groundwork for recruiting while waiting for his contract to be approved. The next few months will be key in that regard as six players have departed since the end of another disappointing 18-15 season. The latest was 6-foot-10 shot blocker Chris Obekpa, a senior transfer from St. John’s who decided to apply for the NBA Draft on Friday after redshirting last year. Former St. John's big man Chris Obekpa, who sat out at UNLV this past year, will declare for the NBA Draft without agent, source told ESPN.